"This date: September 11, 2001, will be remembered in US history and to you, as a day that changed the way we live forever. 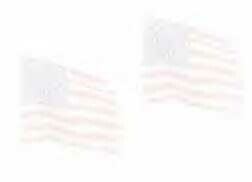 As Pearl Harbor did on December 7th, 1941 (nearly 60 years ago), now our generation will never be or feel the same. In light of the tragedy, with news footage running 24 hours a day that week, we decided to still run the Battlement Trail. If just to 'get out' and away, come together, and step back, if only for a few days. Don't ever forget what happened, and stay safe in these unsure times to come....we will prevail." "Battlement is my favorite trail!!" 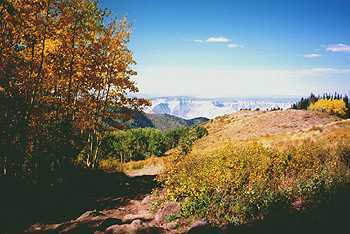 Using an excerpt from last year's trip: "Many of you have whizzed by the small town of Parachute-Battlement Mesa (exit 75) on I-70 west on your way to Moab. The mere mention of the Battlement Trail, and you know what you mean, especially if you've had the chance to run it. 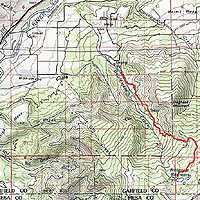 The Colorado State Association rates the trail a 9 out of 10 dry and a 10+ wet. Rocks and mud, rocks and mud, then throw in a steep hill climb, and add some more rocky and muddy sections, and there you have it…that's Battlement. 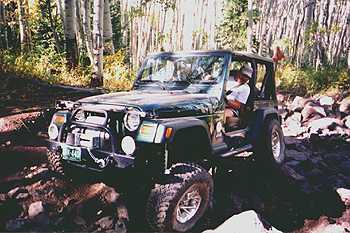 With lockers it's a blast---going stock would be a challenge. 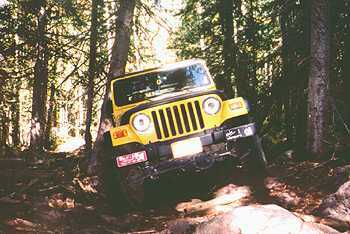 The trail is an up-and-back, and it's the type of trail that keeps your attention all day on your driving, or you and your undercarriage will pay the price." The trail hasn't changed! Over the weekend of September 14th-15th, Drew "Drewby" Middleton (TJ), Jed McClelland (CJ), Bobbette "Smiley" Mathews with Catherine and Michael (TJ), and myself (CJ) with my jeepin' side-kick Molly headed out west on I-70 Friday night from the I-70/Morrison exit at 5:30pm. 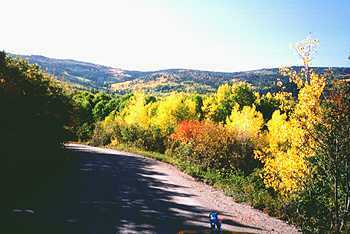 We arrived at Jed's brother's condo south of Glenwood Springs, which would be our 'camp' for 2 nights. Thanks to Jed's brother for the nice crib. Jed then took us all out for a Mexican dinner on him for his birthday, thanks Jed! 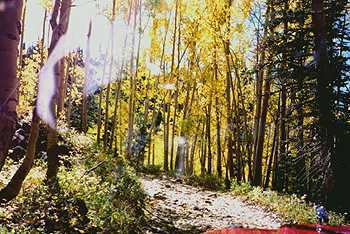 On Saturday September 15th, we were up with the late summer sun, and headed west on I-70 about 40 miles to Parachute and the trailhead of the Battlement Reservoir Trail. 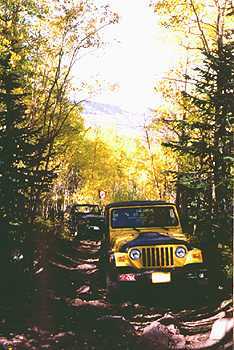 This is one of my favorite trails in Colorado, even though it's an 'up and back' trail, it's well worth the effort to get there!! 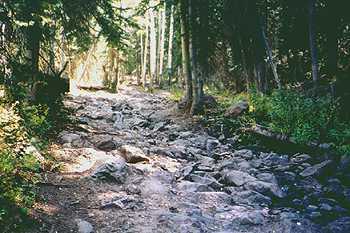 With a constant variety of trail conditions and attention-getting rocks, this trail is a must-do one every year! 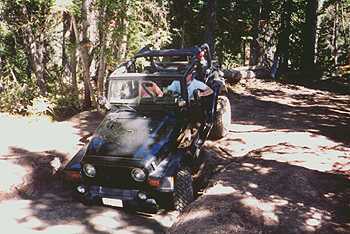 We aired down and did the 'disco' at the Conoco in Parachute, and headed up towards the trailhead. 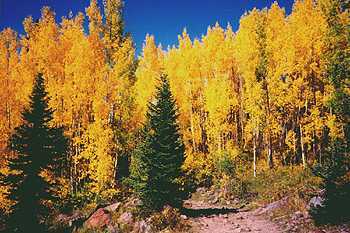 On the road up to the trailhead, the Scrub Oak and Aspens look like they were painted on canvas right out of the frizzy-haired guy's easel (you know, the one with the 'pretty trees' TV show). Shades of orange, yellow, and green were everywhere!! We made it to the trailhead (there is no mistaking it), and took care of some business before the real fun begins! 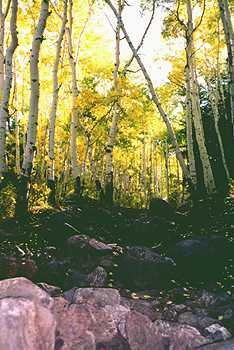 After climbing a bit thru the golden Aspens, one comes upon the famous "Rock Garden" of Battlement. I and Bobbette opted for the go-around, while Jed and Drew were ready to tackle the rocks. Picture for a second, a rock quarry with "boulder-sized" obstacles up to 3' high lined up in random fashion with many degrees of lines to follow. Well, that's the "Rock Garden" in nutshell. 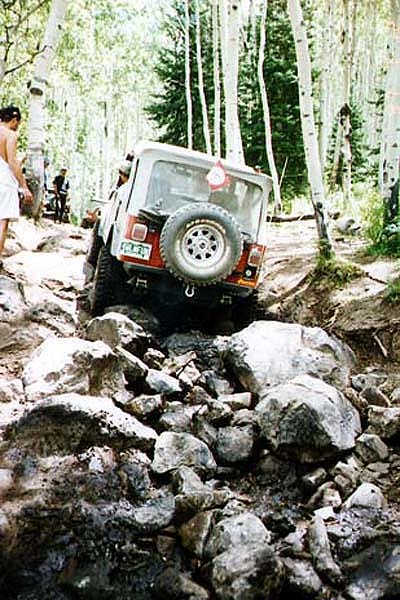 My earlier attempt at the "Rock Garden" in 96'...I still have nightmares! 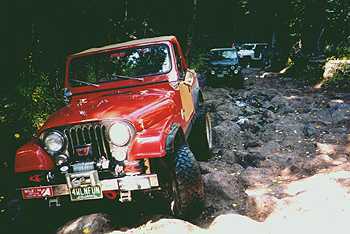 Jed was up 1st, and with his locked up front and rear, 4.56 gears, and lifted CJ, and was able to pick and choose his line while crawling his way thru nicely. Just a few inches one way or the other really makes a difference. 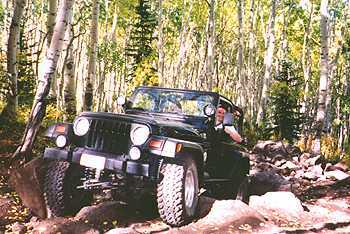 Drew and Jed showed great patience and control with jeep place-ability for maximum fun and safety. Drew was up, with a similar line right down the center. Both came out with smiles and high-fives! 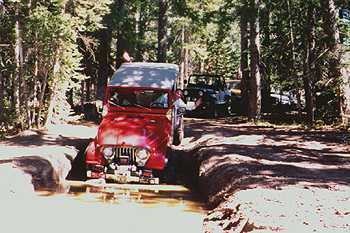 Just above a few yards is a small ditch to cross, which maximizes any suspension. Moving up the hill, the trail throws more "mini" rock gardens at you. One in particular was a field of moderate-sized rocks that were fun to negotiate (someone did make a go-around in the woods around it). Your constantly on your 'toes', as anyone of the good 12" rocks could lurch up and smack your diff. 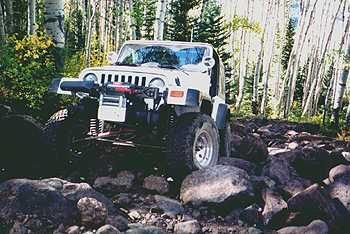 One rocky section after another keeps the your attention on the trail, as one little challenge after another rewards you with making the long weekend trip from Denver. 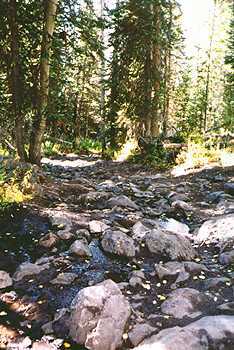 Up the trail, a rock section runs along a small creek, yes, more rocks. One could not resist the challenge of a really big log to try one's hand at balancing, as Jed and I took turns at it. 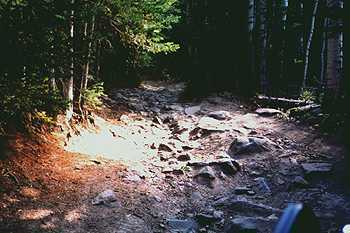 The trail is also a constant steep grade, with the dirt being mostly clay, it can be a real challenge if tried on a wet day. 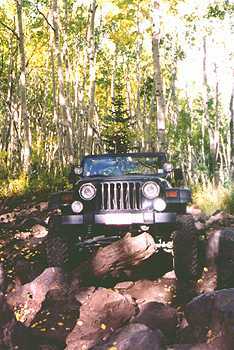 Hey, one thing about this trail, if you like one section or the whole trail going up, you get to do it all over again going down!! Hey look...More rocks!! This trail is full of them! 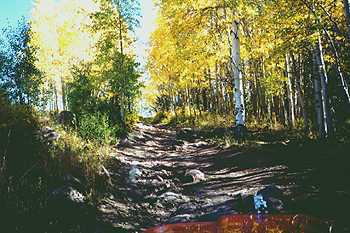 The final stretch of the hill climb ran thru some nice golden aspens contained some smaller rocks to climb at about a 35-degree+ slope. Even Bobbette (who has a smaller lift and tires, and open), picked all the best lines to avoid any under carriage 'kissing' all day. She has learned a lot in a year, and can keep up with the best of them. 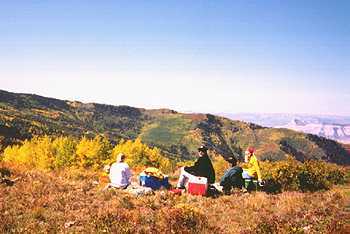 We finally reached the top of the steep hill climb and had lunch with golden aspens and views of the Anvil Cliffs and the Rifle Valley below. 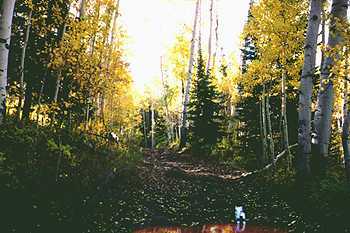 show the true steepness of this climb...nice aspens! After lunch with the bees, we moved on up thru a small meadow and back into the rocks again. Small mud holes from 1' to 3' deep now dot the trail. There are some go-a rounds on the deeper one, but most are fun to run thru. 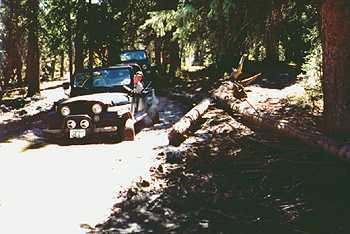 We passed on the first mud hole (we would play on it on the way back down), the said a few words for a fellow Hobo Scott "Mad Max" Maxwell who had found out how deep one was by attempting to run it last year and getting stuck. 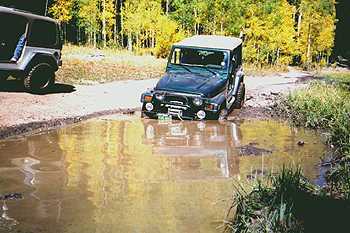 Now that we were all a little dirty, smaller mud holes were fun to play in, just like being a little kid again. The trail dished out mud hole after mud hole just to our liking. Not to big, and not to small. 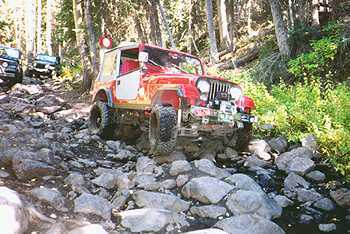 On thru more rocky sections, (rocks and mud-remember? 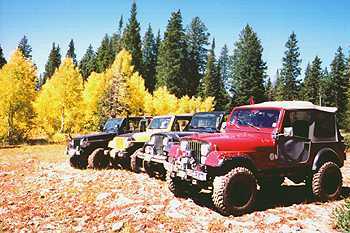 ), and one part even ran thru a real rock field we went. One change though, the big mud holes Battlement is famous for were closed and a road went around them up to the lakes. 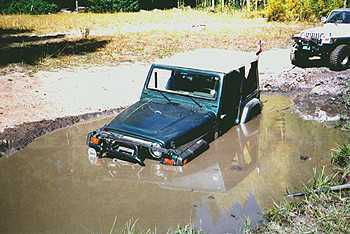 Up at the lakes, Jed soon discovered he would have to 'baby' his Jeep the rest of the weekend,,,,,it wouldn't start at the 1st lake. Think the mud holes and water messed up some of the electrical, it started up after a couple cranks (stay tuned). 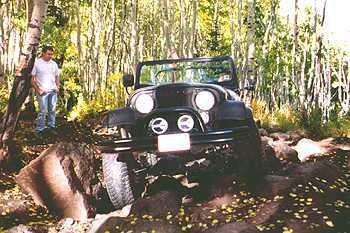 We took a side trail to the upper lake and played with a ravine that flexed even the stiffest suspensions. Well, that was half the trail as we were (50%) complete. Yep, guess what--everything we just did--we get to do again, just backwards!! Coming down the hill was different, and yes the same rocks were there just waiting for a chance to take a bite out of a diff. It is faster going down, and we made it down and thru the many obstacles. 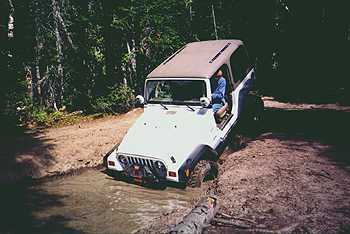 One of the 1st mud holes (made famous in 96' when Barry Shield got introduced to it), we thought we would straddle the 'high solid ground' in the middle of it. With a deep hole to the left, and a certain mud run on the right, we all squeaked thru. 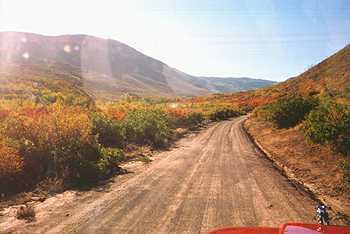 Down at the trailhead we were grateful for some semi-smooth roads ahead back to the Conoco in Parachute. We aired back up and put back on the disconnects. 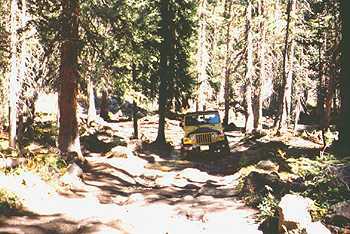 Those silly Jeepers, they drive up and down a 3 mile trail, take 6+ hours, get muddy, and really really enjoy it!! As I said last year: "What a trail! Battlement is all that it's advertised and more, you need to go try it. 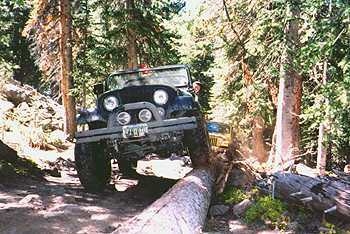 Coming from a "conservative" mode of jeeping like myself, and not an real extreme jeeper". Remember Jed, well, he was in 'push-start mode for the rest of the weekend. We thought it might be the starter solenoid, so we were on a mission to find one at 5pm on a Saturday. Well, come to find out after we sniffed out every auto parts store in Parachute and Rifle, nobody stays open late on Saturday afternoons in small towns! So we opted to try larger Glenwood Springs in the morning. Back to the condo, and off to some buffalo burgers and beer! Battlement was (once again) a blast!!!!!!!!!!!!!!!!!!! "Battlement Mesa was great! Fantastic trail, the foliage was amazing, and the rock garden was quite a challenge. Thanks to Bill and Jed for stacking all those rocks for me!!! Special thanks to Jed for letting us crash at his brother's townhouse in Glenwood Springs. 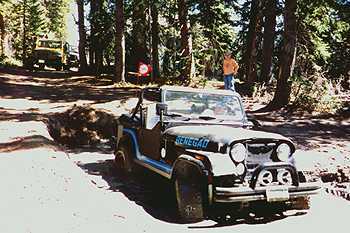 Of course, we repaid the hospitality by push-starting Jed's CJ about 100 times (well, it felt like 100 times). Jed, did you get a new starter yet? Fortunately, Jed's starter was the only real carnage on the trip, although Bill might have to get a new MHJC license plate. A submerged boulder reached up and tagged Bill's bumper from the depths of a really nasty mud bog, and the MHJC plate took some shrapnel from the encounter. 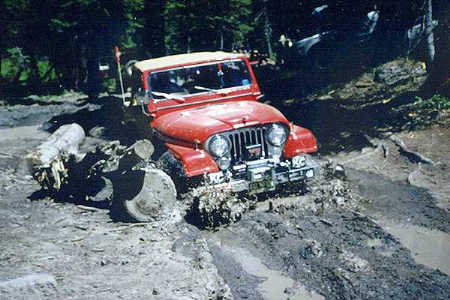 Bill was kind enough to push the boulder out of our way before the rest of us ventured into the mud."